Plica polonica is an uncommon condition characterized by diffuse matting of hair. It can be caused by various conditions such as psychiatric illnesses, pediculosis, pyoderma scalp and shampoos. 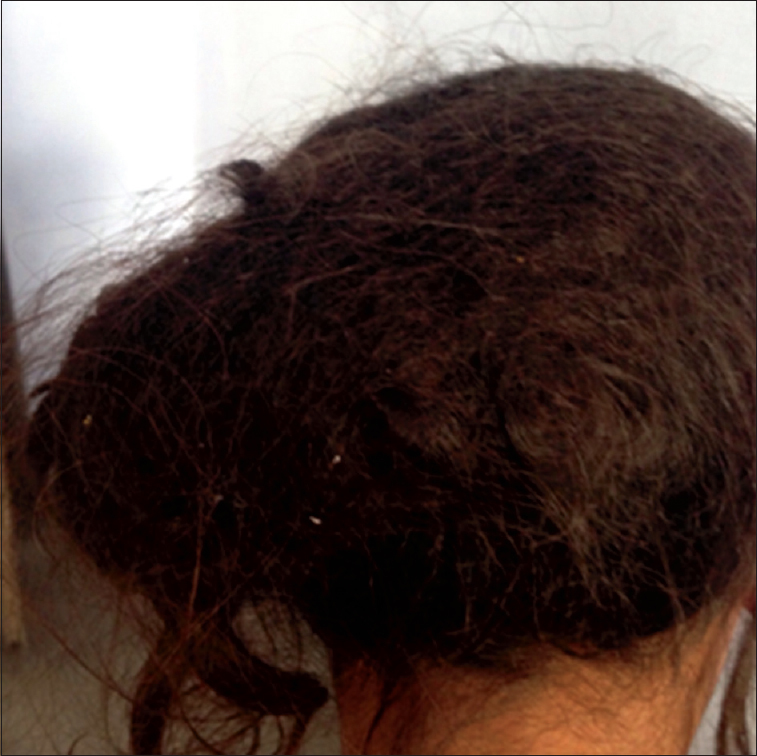 It was prevalent in Poland in the 19th century, hence the name plica polonica or polish plait., Here, we report a case of a 12-year-old girl who presented with a mass of entangled hair for the past 1 month. The patient gave a history of application of some shampoo. Immediately after its application, she developed matting of hair which could not be detangled even with repeated washing. The problem was persistent and the patient was unable to comb her hair. On examination, the patient had a bunch of diffusely matted hair giving a bird's nest appearance [Figure 1]. The texture of the hair was coarse. Nits were present in the occipital region, and some erythematous pustules were also present in the occipital region suggesting pediculosis and secondary infection. Suboccipital lymph nodes were enlarged. General physical examination was unremarkable. The patient had a history of an episode of seizures 3 years back for which she was put on some antiepileptic. Based on the history and clinical findings, the diagnosis of plica polonica was made. The exact mechanism of matting is not understood, but it may be caused by longitudinal splitting or feathering of hair, gluing of hair due to exudates from infected lesions on scalp, and frequent use of certain shampoos. However, the most common cause is generalized neglect which leads to infections and infestations of the scalp causing exudation and constant curling of hair which may occur in patients with various psychiatric disorders., The strength of hair depends basically on disulfide bonds. It is proposed that it is the breakage of these bonds which leads to matting of hair. The treatment consists of trimming of entangled hair, various hair-conditioning agents, treating the underlying cause such as antibiotics for infections, permethrin for pediculosis and treatment for psychiatric disorder. There are not too many reports of plica polonica due to the use of shampoos, so the case is reported for its rare presentation. Pavithran K. Plica neuropathica causing traction alopecia. Indian J Dermatol Venereol Leprol 1990;56:141-2. Ghodake NB, Singh N, Thappa DM. Plica neuropathica (polonica): Clinical and dermoscopic features. Indian J Dermatol Venereol Leprol 2013;79:269. Kumar PN, Rajmohan V. Plica neuropathica (polonica) in schizophrenia. Indian J Psychiatry 2012;54:288-9. Joshi R, Singh S. Plica Neuropathica (Plica polonica) following azathioprine-induced pancytopenia. Int J Trichology 2010;2:110-2. Miranda-Vilela AL, Botelho AJ, Muehlmann LA. An overview of chemical straightening of human hair: Technical aspects, potential risks to hair fibre and health and legal issues. Int J Cosmet Sci 2014;36:2-11.